Here is a beautiful aerial photograph of our golf course! Photo was taken in 1998 by a crop duster pilot for the local orchard. Here is an early score card. 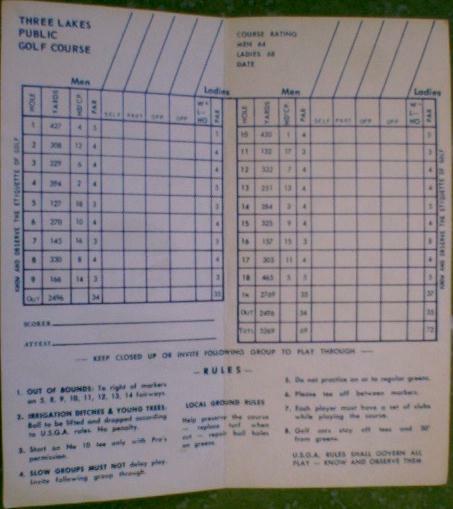 There have been many changes to the score card throughout the years. The Golf Course was re-rated in 1999. In 1955 Men's and Ladies Divisions were set up for the benefit of the members. In the early days Jim and Fran Hart managed the golf course. Starting in 1956 PGA Professionals were hired for golf instruction and management of the golf course. Walt Jefferson was the first PGA Professional to be employed by Three Lakes Golf Course. This picture was taken in 1961 for the Junior Program, which is currently still going every summer. The next Professional was Loyd Harris. He only worked for one season. 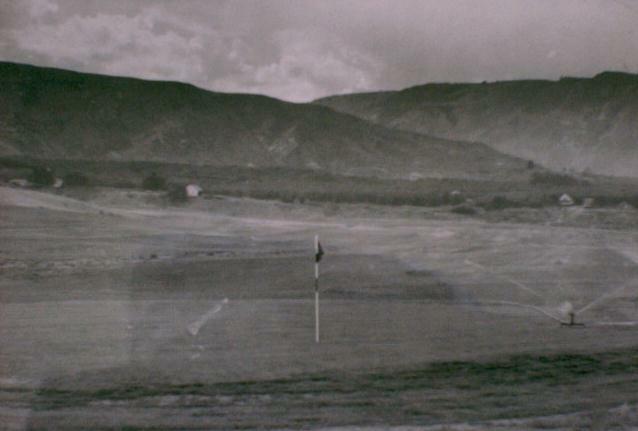 One of the first greens built shortly after the tractor work was completed. This is currently the green for hole #9. It was played as a 126 yard par 3 until the second 9 holes were added. 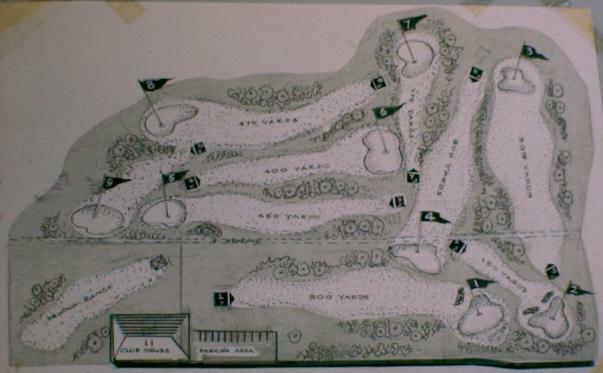 Proposed plan for the golf course in 1953, they built 9 holes to start. Many people volunteered to help with the labor. The other 9 holes were built in 1964. 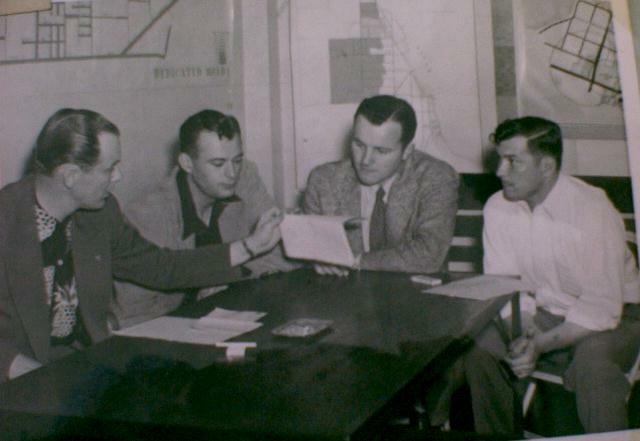 Early Founders planning the construction and layout of the Golf Course. They had to design the course, purchase water for irrigation, buy equipment and build a clubhouse. We still have the original blue prints. 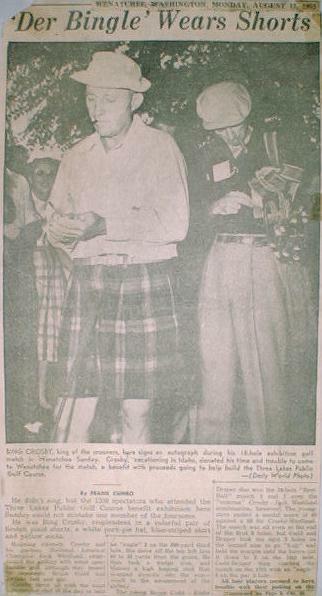 Bing Crosby donated his time for an exhibition match to raise money for the building of Three Lakes Golf Course. The foursome was Bing Crosby, Jack Westland (1952 US Amateur Champion), Bruce Cudd (1953 Northwest Open Champion), and Eddie Draper (Washington Sate Open Champion). Crosby 49, and Westland 47, paired off against Cudd 20 and Draper 24, in a "Youth vs. Age" match. 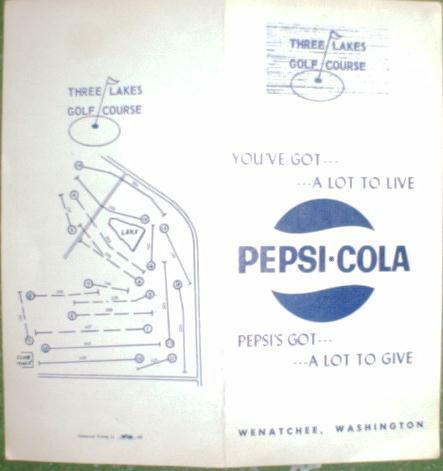 This match was held at Wenatchee Golf and Country Club. The exhibition match raised the remaining needed money to start construction. Reid Knauss was the first President of Three Lakes Golf Course, and worked closely with Clinton Kienitz in building and designing our golf course in 1951. The land that the course sits on was purchased at an auction by Harold Weed. The price of the land was only $4,505. He then sold it back to Three Lakes Public Golf Course for a figure of $4,000. He gave Three Lakes eight years to pay it off (with no interest)! Harold Weed asked for the top knoll that stood in the middle of this land. Reid and Clinton thought this knoll was worthless and gave it to him. He built a beautiful home on top of that knoll in between holes #17 and #14. Reid needed to raise $25,000 to start the construction. He initiated the sale of non-profit stock in Three Lakes Golf Course to help raise the funds needed. Much was raised through local businesses. 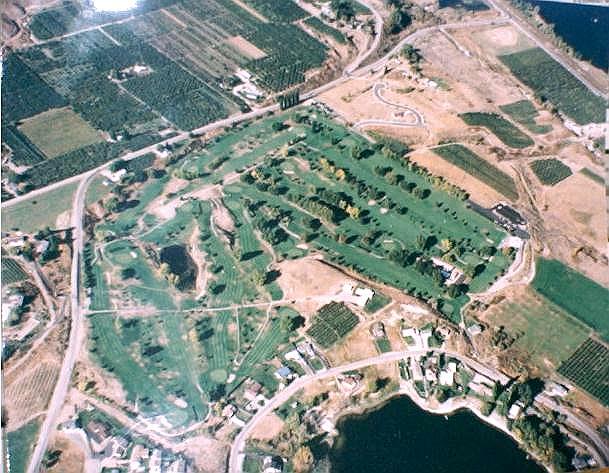 I decided during the year 1951, Wenatchee needed a public golf course where anyone could play. Consequently, from the year 1951 to 1952, I looked for a suitable location. This idea, with lots of determination and challenges, turned out to be more work than I bargained for, but has proven to be well worth all the effort. My first step was to look for a suitable site for the course. I had several available sites which I visited during this period, namely, Sleepy Hollow - across the Wenatchee river from lower Sunnyslope, the old race track just east of the present course, which is presently known as Three Lakes Country Estates, the old abandoned golf course at the confluence of the Wenatchee and Columbia rivers, a farm up Number Two Canyon, and the present 92 acres on which the course is now located. I was doing this alone, without a committee, so I contacted Charlie Jefferson, the pro and greens keeper at the Wenatchee Golf and Country Club. He agreed to help if I would furnish the transportation. Charlie examined all the sites with a golf iron, swinging as he walked. I believe he did this in order to judge the distances. We concluded that the race track was too expensive and after careful consideration, settled for the 92 acres which is the present location of the golf course. (Reid Knauss has some pictures of the course after we cleared some of the land). I believe I may have a picture of the land before we began to clear it. The orchard had been pushed over during the depression of the 1930's and suckers had grown out of the tree holes. It looked like a battlefield, but Charlie Jefferson recognized the potential. Charlie did a lot of professional work on this and later, in building the course, and deserves a lot of credit. We leased the land for fifteen years through a trustee set up with an administrator of the estate. The first committee meeting was held at the service station of Clinton Kienitz for the purpose of finding out if any water was available to use on the course. Present at this meeting were: Cyril Balch, Harold Tedford, Harold Weed, and the ditch supervisor of Lockwood Kennedy ditch. There was no ditch water available at that time. We discussed whether or not it would be feasible to dig a well, pump the water out of the Columbia River, or buy shares. No conclusion was reached at this meeting. Meantime, I was still running around town trying to interest people in promoting and building a public golf course. I met Reid Knauss at the bank one day and he asked me about the project. I told him I was about ready to give up on the idea. He called me a few days later and said, "I believe I can help you." What I didn't know, was that he was the president of the Wenatchee Junior Chamber and along with that, one of the greatest organizers in town. We got together and called a meeting of interested people, elected Reid chairman of the group. 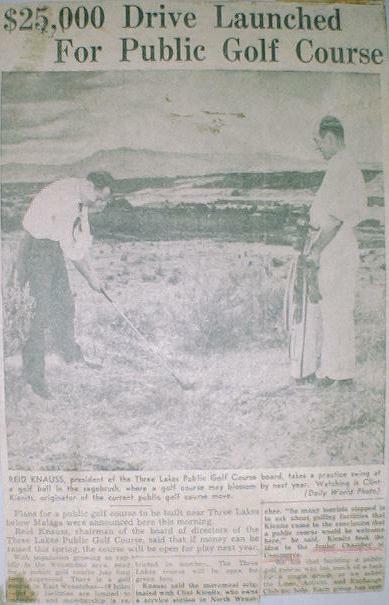 Reid Knauss was also the first President of Three Lakes Golf Course. Our first committee consisted of two members from each service club in Wenatchee, plus two independent people of which Clinton Kienitz was one. The Rotary, Kiwanis, Exchange Club, Jr. Chamber, Active, and Lions were all participants. We received very little physical assistance from the Kiwanis and Rotary Clubs, but it was a smart move to include them because we needed their financial support and backing for the project. Purpose, or jobs for the committee included: to purchase the land, (give up the lease Clinton Kienitz had). Harold Weed purchased the land for us at an auction for $4,505.00, the terms being $800.00 per year, the first payment in golf stock with no interest ever, plus he donated one year's payment when we were in trouble financially. Considerable time and effort were spent searching for old wells and Lockwood Kennedy water shares. Harold Weed heard about some shares for sale in Seattle, so Reid Knauss bought them and we had irrigation water. Reid Knauss had organized workers to clear the land by this time and we were ready to go to work. As I said before, this place was a mess, but we had farmers with their tractors helping, lots of service club members, and other interested citizens working. When we pushed all the brush together, we enjoyed one of the biggest wiener roasts in town. Reid Knauss had all his Junior Chamber members recruited and they really worked, but we independents and the farmers also made a big showing. Harold Weed, Cyril Balch, Harold Tedford, and some other farmers came down to work with their farm tractors and spent many hours clearing the land. Jim Uecker also loaned us tractors without drivers, from his implement shop. Leveling the land is another story. We bought an old ford tractor and everyone on the committee wanted to run it. I believe it was in operation about twenty hours a day leveling that spring. (We really got the land too level for a golf course). The city grader came down, (thanks to George Knauss), and graded some of the land. Alcoa sent in a tractor, Tom Larson Construction sent a grader down and Morrill Paving helped build the road to the club house. This work was all donated. When it came to financing, all members of the committee were on this committee. When they weren't working on the golf course, they were out collecting money. I believe Archie Lodge and Homer Crollard were Co-Chairmen of this project. We worked all spring to try and reach our goal of $20,000. We received some real turn downs but we also received a lot of encouragement. We learned some real lessons in selling when we called on our biggest contributors which were: Alcoa, Wells and Wade Hardware, and Wells and Wade Fruit Company. Most everyone gave generously. Archie Lodge and I worked as a team and we sold more stock and received more donations than any other team. During the summer of 1953, we slowed down to almost a halt and needed some encouragement to spur us on. At this time, some of the committee came up with the idea of a golf exhibition. It was mentioned trying to get President Eisenhower to play, but Dr. Arch said, "I think I can get Bing Crosby to play a exhibition match at the Country Club." He almost depleted our treasury with phone calls to Spain, Hollywood, Hawaii, and finally located Bing at Elk, Nevada on his ranch. He consented to pay a match in Wenatchee in August. They made a date for August 16th 1953, which was the time of Bing's vacation in Hayden Lake, Idaho. The match took place at the Wenatchee Golf and County Club at no charge to us and with lots of help from the Country Club members. The Juniors won, but Bing won the hearts of all the crowd. He also chipped in from 100 yards out on hole number three, for an eagle. We had anticipated a large crowd and a profit of four of five thousand dollars, but ended up with about $1000 profit. This renewed our enthusiasm and also gave us beautiful publicity and in no time we were up to our planned $20,000 cash and pledges. While we are speaking of finances, Archie Lodge (now deceased), gave more of his time than any other person. He served on the golf board from 1952 and continued as secretary and treasurer until his death about 1970. At this time, we were ready for the lay-out, shaping as well as the planting of the fairways and greens. The committee and some of the avid workers all had ideas regarding the lay-out of the course. Everyone was an expert, so they thought. Walter Pursey, a golf pro from the Seattle Rainier golf club, with the help of Reid Knuass, laid out the first 9 holes. They circled the greens and marked the center of the fairways. I took Charlie Jefferson out the next week and he gave the lay-out his approval. He was dubious about making a green where number 12 is now. Jim Scofield was Chairman of the irrigation project. This pipe had to be laid before we could do any planting. Jim laid out the system on paper and on the fairways, also helped get donations of pipe and fittings from carious merchants. Welders in town were lined up to weld the pipe and donated their equipment, and sent men to weld the steel pipe. This pipe had to be laid from the irrigation canal up above the course. The total footage was approximately 12,000 feet, over two miles of ditch and pipe to weld. Total cost of the whole system was about $9,000. This was a mass effort and it looked like a bunch of gophers were tearing up the ground. (I don't believe we paid any welder to help out) Jim Scofield had a world of knowledge as a pipe and sprinkler man and he really was sold on the project. More space should be devoted in this history, praising the efforts of Jim Scofield. Jim's job went on steadily for about two months, from daylight until dark. He was a great force in this project, even helping to get the grass to grow after the sprinklers were installed. The shaping of fairways and greens which commenced after those irrigation gophers had finished with another big effort. The overseer was Charles Jefferson (now deceased), walking around with that golf iron in his hand. We hired a greens keeper from the Seattle Municipal Golf Course, a Mr. Gordon to help with the contour of greens. He was in Wenatchee on weekends most of the time. This proved to be a big job and we had to haul in dirt to make contours and then shape it under his direction. We would haul dirt and Cyril Balch would level and spread it. Cyril must have spent a month steady moving dirt with his tractor and blade. It got to be a joke as we hauled the good top soil to the sharp ridged number twelve green--he kept spreading it-- then either Charles Jefferson or Mr. Gordon would come by and say, "more dirt." We hauled fifty of one hundred loads to that green alone. Cyril was great, he just kept smiling and spreading the dirt we hauled. When we were ready to plant the greens, Mr. Gordon was overseer of this planting. It took lots of hard work with rakes to get the clods smooth. There was lots of donated labor here. I remember there were many Junior Chamber members on this detail. We must have been busy for almost a month on planting the greens and also the fairways. The fairways were planted with a donated grass seeder from East Wenatchee Weed District. The fairways were planted very narrow with lots of rough between them. We didn't have the money to spend for seed. The planting was done by Cyril Balch, Harold Tedford, and Clinton Kienitz. Jim Scofield ordered traveling sprinklers to irrigate the course and they worked fine, but did you ever start a lawn at home? It takes lots of care. We had a whole village of lawns to tend and only one man--a man named Tom Sargent, young for his 75 years. This job was impossible for one man to accomplish. Again Jim Scofield came to our rescue by helping water and borrowing irrigation pipe (surface), with sprinklers to help cover the massive lawn. Within a short period, we had grass growing and it was a hot summer so it took lots of water and grew very well. The irrigation system was adequate and everything went well after the grass was matted. We needed a Club House and some young Junior Chamber members found a large shed at Cashmere that was big enough for some storage and a place for the greens keeper (he was ticket seller). This shed was too large to haul legally, so they hauled it during the night. One Sunday morning, here was our shed, ready to level up at the present site of our club house. We have a picture of Harold Weed pulling it into place!! We planted about two hundred trees that summer, after the grass was planted. Needless to say, we didn't have time to water and take care of all the trees, (some were between the fairways and we had to drill irrigate, so they didn't get enough water and some of them died). The dead trees were later replanted by board members when they became president. Number on item was to get the grass growing well. Walt Jefferson was our first Pro and Greens keeper. He did a good job and was a wonderful public relations man. Walt was well liked and influenced a lot of people by his patience and good instructions. The first opening to the public was Labor Day weekend 1954. Two years after the idea was born, we were playing our your own public course--a dream come true! Again, we want to say, without the help of the public minded people helping physically to build this course, and the financial support of the community, and the organizing ability of Reid Knauss to get it rolling, we might not have had a public course in Wenatchee.